For lunch yesterday, I decided to have a toasted English muffin with Peanut Butter and a little butter… who am I kidding, a lot of butter. The first one was sooooo good that I had to have another. My first reaction was to check the date on the English muffins – October 31st, Halloween (the next day). My second reaction was revulsion. My third and final reaction was that I was still hungry. Obviously the first one was mouldy too, how could it not be. 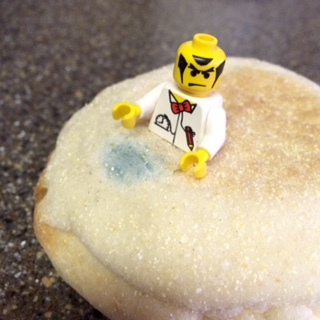 Next, he pulls out some bread covered in small bits of white-and-blue mould. He assures me that it will be fine, toasted, once the mouldy crusts have been cut off. “The moulds don’t go deep,” he says. “The time you really need to be worried about bread is when it has black bits on it.” I decide to pass. I cut nothing off, ate it all. The only black bits I saw were the slightly charred edges of the English muffin. I would have passed too. Ended up eating a can of Thai Coconut soup. I checked the date on the can – some month in 2017… safe.